74 MMS December 2017 mmsonline.com FEATURE replaced by new insert grades and geometries. Tools are more likely to be customized at local grinding facilities as well. Common alterations include cutting to specific lengths, honing edges, imparting variable-helix geometries and applying specialized coatings. The shop is also making increased use of new tool paths, such as the P r o f i t M i l l i n g s t r a t e g y i n D P Te c h n o l o g y 's Esprit CAM software, which drives the turn-mills. These tool paths are designed to remove mate- r i a l m o re ef f i c i e ntl y th ro u g h o ptim iz ati o n of engagement angle, chip load, lateral cut ting force and machine acceleration. However valuable, none of these advances have contributed to alleviating the inspection bot tle ne cks as sociate d w ith more str inge nt quality requirements. As is the case with machin- ing technology, Mr. Ber trand and Mr. Shrader expect new measurement technology and prac- tices to be increasingly useful beyond the most exclusive jobs. After all, in addition to increased precision, por tions of the rest of the mix are beginning to require more data on more par t features, particularly since the installation of the new quality lab. "We built it, and they came," Mr. Shrader says. A POINT CLOUD FOR EVERY PART The central resource of the new quality lab is the new CMM, a Contura with an RDS articulating probe holder from Carl Zeiss Industrial Metrology. Equipped with the Vast X XT articulating probe head, the new system can drag the ruby stylus along the surface to measure a series of points rather than touching off one at a time. 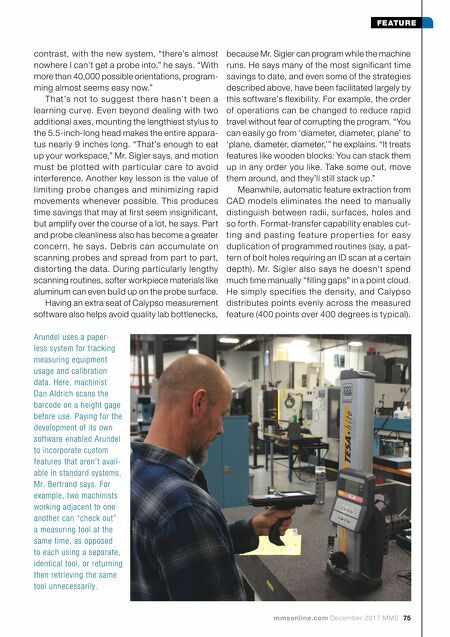 Program- mer Casey Sigler says this capability is a prereq- uisite for work that requires not just greater defi- nition of complex machined features, but also 100-percent lot inspection, not to mention customer review and feedback of the CMM program in some cases. "It's like recording HD video instead of taking pictures," he says about the upgrade from the previous go-to CMM, a machine purchased in 2004 that's still relied upon heavily for touch- trigger probing. Scanning technology facilitates more accurate, repeatable measurements because more data is available for filtering through the various algorithms that interpret it. "Higher input leads to higher output," Mr. Sigler says, emphasizing that the Vast XXT's independent articulation is critical to matching the necessary precision with the neces- sary speed. Limited to only the machine's own three axes of motion, form and feature measure- m e nts wo u l d re q u i re s et ti n g u p s i n e p l ate s and other complex fixturing as well as paying more attention to offsets during programming. 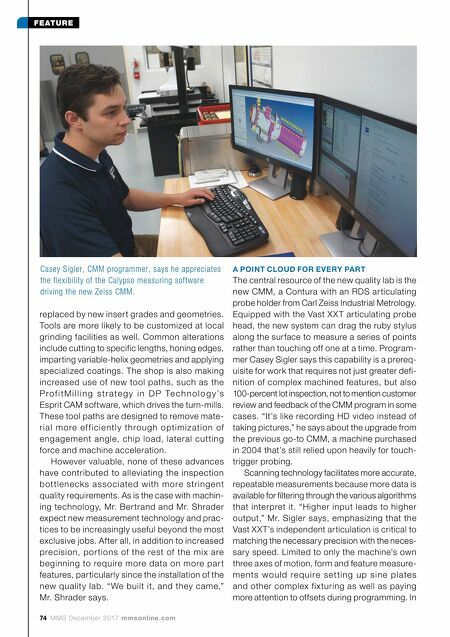 In Casey Sigler, CMM programmer, says he appreciates the flexibility of the Calypso measuring software driving the new Zeiss CMM.